Mike Konczal writes today about our skyrocketing prison population. He attributes this partly to a 70s-era school of thought known as Incapacitation Theory, which basically says the only way to protect ourselves from bad people is to lock them up so they can’t do bad things. It sounds pretty obvious, but where did it come from? I’ve been reading a lot of 1970s conservative criminology lately, and I believe it actually grows out of a critique of the rational choice mode of crime. In the law and economics approach of the Chicago School of Becker, Posner, Coase, etc. it is hard to balance the idea that crime is committed by an estimate of costs and benefits. Risking 30 years in prison to rob a store for $80 can’t really be rationally possible. 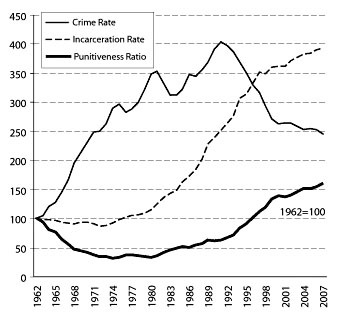 of rising crime rates and shrinking prison capacity over the decade 1964-74 meant that the “price” of a crime — in the form of punishment — had been falling in the teeth of a crime wave. ….In that context, there seemed to be a reasonable case for building more prisons….Indeed, in the intervening three decades we have built prisons, and built prisons, and then built still more prisons, until some of us who supported expanding prison capacity from its low 1970s level have started to feel like the Sorcerer’s Apprentice, vainly looking for the “off” switch on a mechanism gone completely out of control. ….The punitiveness index, which fell by 68 percent from 1962 to 1974, quintupled from 1974 to 2007. The punishment-price of a burglary, which fell from fourteen days in 1963 to four days in 1974, reached sixteen days in 2007. But the political, ideological, legal, and administrative impetus behind the prison-building boom, which developed when crime was frighteningly high and rising, has not noticeably dissipated now that crime has decreased. I had dinner with Mark a couple of months ago, and his shorthand opinion is that in 1974 it made sense to build more prisons, and by the mid-80s or so we’d built about the right number. But then we kept right on building and now we have way more prisons than we need. We’ve made the cost of crime far higher — both to us and to the criminals we’re trying to deter — than we need to. This is actually just the starting point of the book, which is largely about ways we can reduce crime, and especially crime committed on probation, without putting ever more people in prison. If you haven’t read it, you should. Here’s a review from Forbes to get you started.